I think we all have heard of foie gras or “fatty liver” , but how it is produced and what’s involved is not always known. In fact, the foie gras farmers and their representative organisations in France try to ensure that you don’t find out how things really are. Foie gras: the fatty liver of a goose or duck. Ducks and geese can naturally store fat for times of scarcity and in preparation of migrating. Originally the animals were slaughtered only just before they would start to migrate. But to be able to deliver foie gras throughout the year, the industry figured out a way to allow the animals to be slaughtered all year round, namely by force-feeding them. To facilitate the force-feeding the animals are generally kept in very small cages with mesh or bars on the bottom to allow their faeces to fall through. In twelve Member States of the European Union the production of foie gras is banned or the law that prohibits cruelty to animals is construed to ban the production of foie gras. 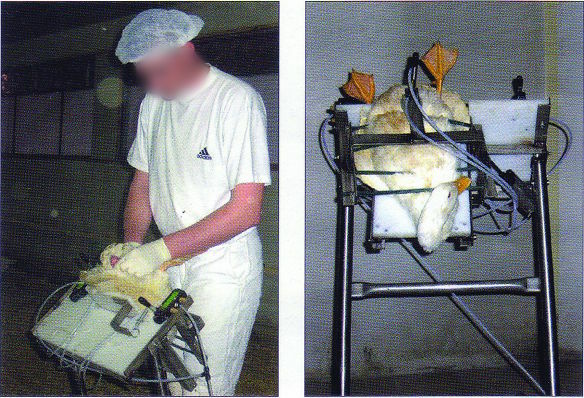 In 2003 the production of foie gras was banned in Israel, then the largest foie gras producer after France. 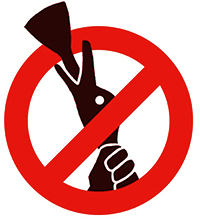 Also in Switzerland, Norway and Argentina, it is forbidden to feed geese and ducks for foie gras under duress. In the EU, foie gras is produced in only five countries, namely France, Spain, Belgium, Hungary and Bulgaria. In France, foie gras generally comes from ducks (about 97%) and much less from geese. That equates to about 40 million ducks and 700 000 geese . Foie gras is a protected name under national and European regulations. A fattened duck liver may only be called foie gras if it weighs more than 300 grams, while a normal duck liver is just 50-70 grams. The livers that are sold as foie gras, can be up to 10 times bigger than normal livers. But let’s begin at the beginning: it all starts with the mother duck. The chicks that grow to become mother ducks come from a hatchery and are reared in large barns. Below is a video of such a barn. The ducks live all the time on the same layer of straw. Once in a while a new layer of straw is laid on top to cover the filth, faeces and water. After just a few days it starts to stink badly in and around the barn and the air is stuffy and stale. The ducks live under these conditions for 3 to 5 weeks until they are big enough. Ducks and geese belong in and near water. They have a natural need for water for bathing, cleaning and reproducing. In the absence of water, a waterbird is not able to do its natural behaviour well or even not at all. As a result eye infections and infections under the feet are legion. The ducks and geese can not move well in the barn: they don’t have enough room (about 6-7 ducks per square meter) and they are not built to be out of the water for long periods. Because of being in such stressful conditions they may bite each other. To prevent this they may have their beaks cut which is done without anesthetic and so is very painful and stressful. The sperm is then injected into the female. On the site of a L214 an animal protection organization in France, you can see a picture showing how it is done. After about 66 weeks in the barn the mother ducks are slaughtered. In their short miserable life, they would have laid about 270 eggs each. A duck in nature would have laid only 30 at its most. This high rate of egg production has some consequences on the well-being and health of the duck: diseases such as peritonitis, inflammation of the oviduct and ovaries, and an overall reduced resistance with other infections as a result. Of course ill ducks do not receive additional medical care, leaving two possibilities: either the farmer notices that the duck is deteriorating and it is slain on the spot, or he does not notice it and they die a slow, painful death. The eggs are incubated. When they hatch the ducklings are sexed and separated. Because the female ducks’ livers contain more nerves, only the males ducks are used for foie gras. All the female ducklings, over 40 million per year, are gassed or crushed to death. Very recently L214 has published a new film about what happens to these chicks. These images were filmed in a hatchery in Brittany. The males are reared in sheds as described above for 3 to 5 weeks. Then, if they are lucky, they are let outside for a while until they are 11 to 12 weeks old. The images that the foie gras farmers show you of ducks and geese on a beautiful green meadow with shrubs are downright wrong! The reality is very different. The ducks live on a bare muddy patch of ground as you can see in these images. Finally, the ducks are put in cages (individual or group cages that are not much better) where they are force-fed. Twice daily for 12 days a fat corn mash is pumped through a funnel or tube in the throat directly into the crop. I do not think necessary to describe how force feeding is carried out in detail here. The following pictures speak for themselves. – Force-feeding is not horrible, we know what we’re doing and ducks are force-feeding themselves before they fly over the oceans during migration. “No!” says L 214. The ducks that are used for foie gras are specially bred ducks such as the Muscovy duck, the drakes can not fly well and sometimes even have trouble walking because they were bred to get big and fat quickly. They often weigh more than 3 kilos. – It is not a disease, because if you stop force-feeding then the liver naturally becomes small again. “No!” says L 214. Diarrhea, overheating, severe respiratory problems, broken bones and bruises in the neck are the consequences of force-feeding, and proportionally more ducks do get sick and die than if they are not force-fed. Studies show over 10% more deaths. And we’re not even talking about the fear and pain …. At the end of 2013 L 214, made a lot of waves by showing images of six farms in the Vendee that produce foie gras for the mark “Ernest Soulard”. Ernest Soulard supplies foie gras to the big one-star restaurants in Paris Le Fouquet’s, Le Georges V, Le Royal Monceau, L’Atelier de Joel Robuchon, Le Jules Verne et le Meurice (Alain Ducasse), Lenôtre, le Shangri-La, le Baudelaire et la Grande Brasserie FLO. The images that you see here, are, I think, horrific images for everyone. But the fact that we find it horrifying does not really mean much. What does have value is the conclusion of a scientific study of the Scientific Committee on Animal Health and Animal Welfare of the European Union, which says that “the practice of forced feeding is detrimental to the welfare of the animals.” This report is the basis for further recommendations made ​​by a committee of the Council of Europe and there are directives of the European Union which say practically that force feeding and the raising of geese and ducks in cages is not allowed. To make an already too long story short : here too France violates the rules for the protection of animals…. Even worse, the French government said secretly that farmers are allowed to use individual cages until the end of 2015. We therefore say again NO! to France and STOP FORCEFEEDING! What can you do? Avoid Aquitaine, Midi-Pyrénées (Gers), Brittany, Pays de la Loire and Alsace this summer or if you’re there let your voice be heard that you are against foie gras!